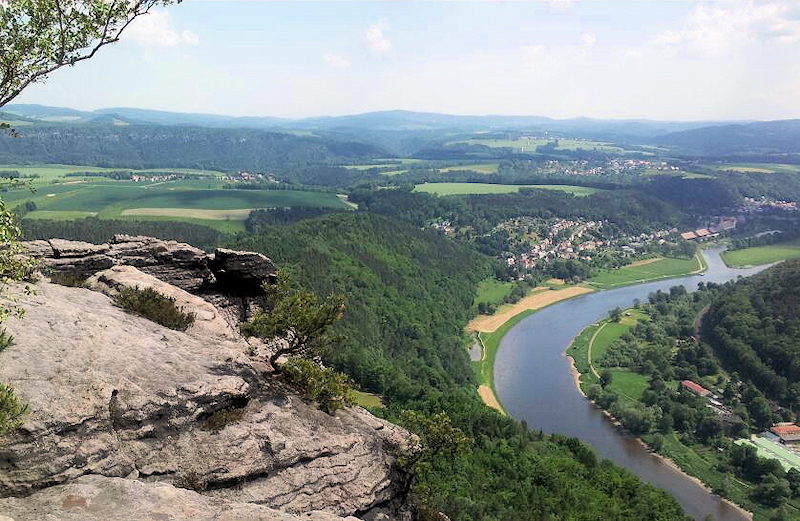 A 4:00am start, a bus, a plane, a taxi, a train and another taxi found me in the village of Krippen along with Clive, Jim, Steve and Tony G. Krippen is on the River Elbe opposite the town of Bad Schandau in Saxony, near the border with Poland and the Czech Republic. We were there at Clive's invitation for six days' walking and two days sightseeing - the sightseeing being the cities of Dresden and Meissen and anything else interesting we passed on the way. 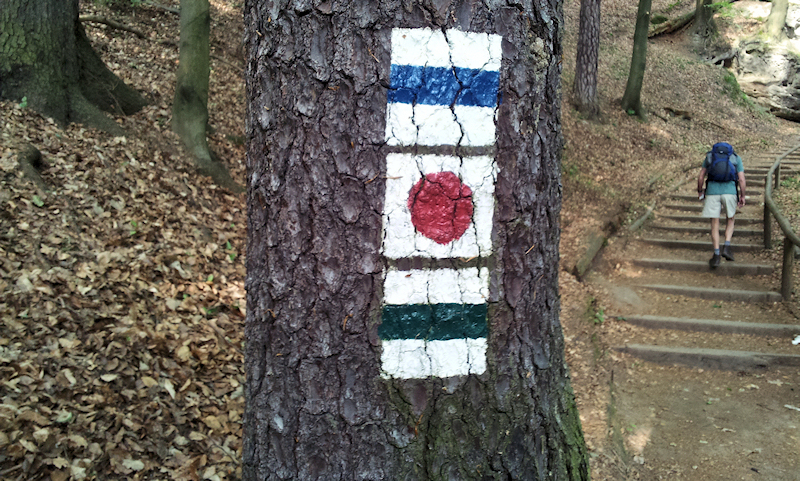 We were going to follow two named walking routes, the Malerweg (Artists' Way) and the Sächsische Weinwanderweg (Saxon Wine Walk). 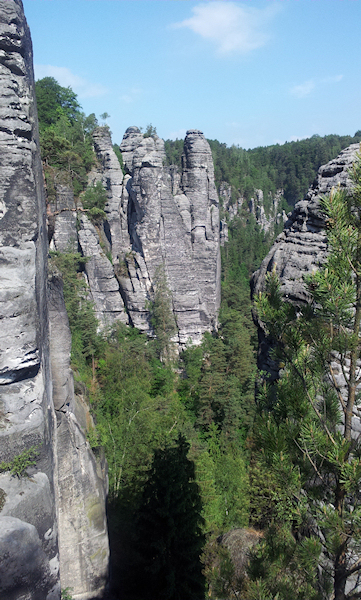 The local tourist board markets this part of Germany as "Saxon Switzerland" ("Sächsische Schweiz"). It's like Switzerland to the same degree as (using a comparison of Jim's) Bourne End is like Prague. 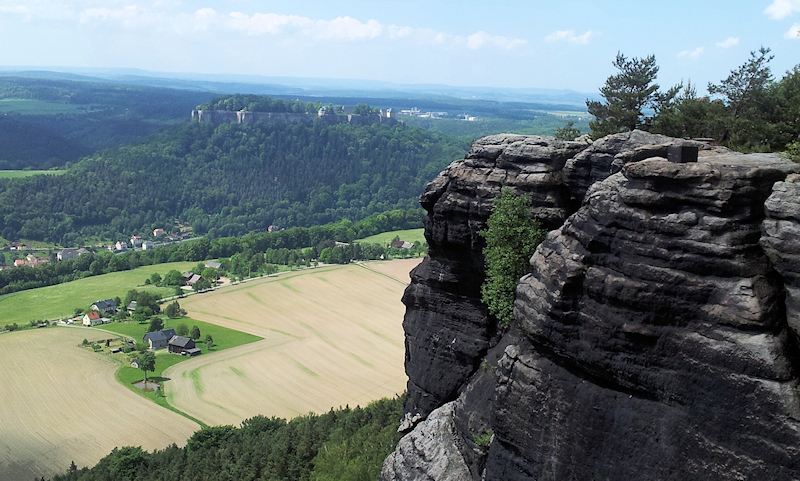 But it does have a unique landscape of towering sandstone bluffs and crags and is popular with walkers and rock climbers as well as the German romantic artists who allegedly walked through the region with their easels, palettes and brushes. The first two days went well enough. A slow start while we shopped for food and last-minute necessities in Bad Schandau, then we were on our way. Clive, at first unhappy with the absence of Malerweg signs later switched to being unhappy about them when they appeared and seemed to be taking us in the wrong direction. 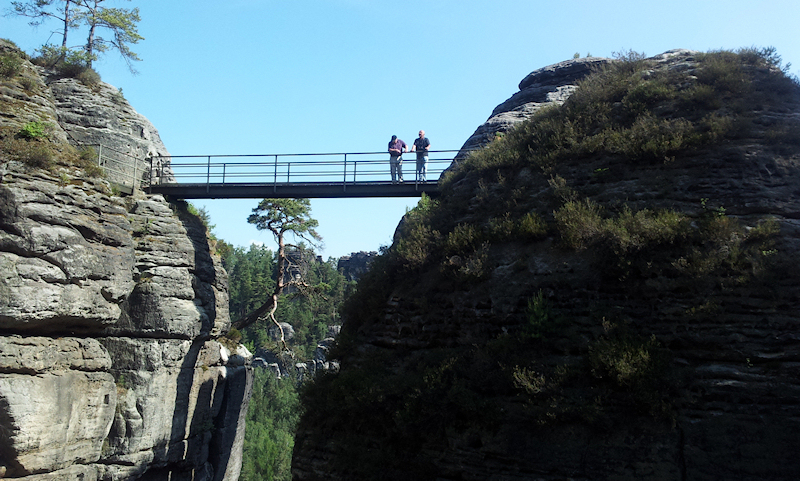 The Lilienstein and Königstein on the first day were the overture to the highlight of the Bastei on day 2. 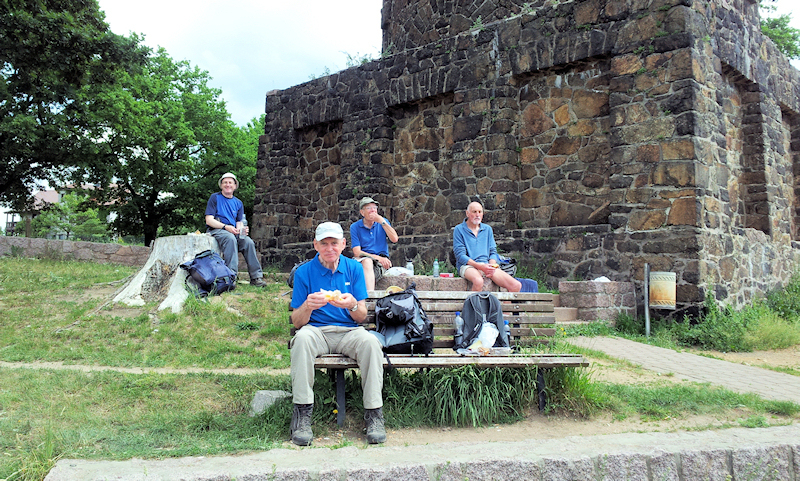 We spent that night in the the town of Pirna, reached after a long walk along a flat tarmac road in full sunshine - a foretaste of the days to come. 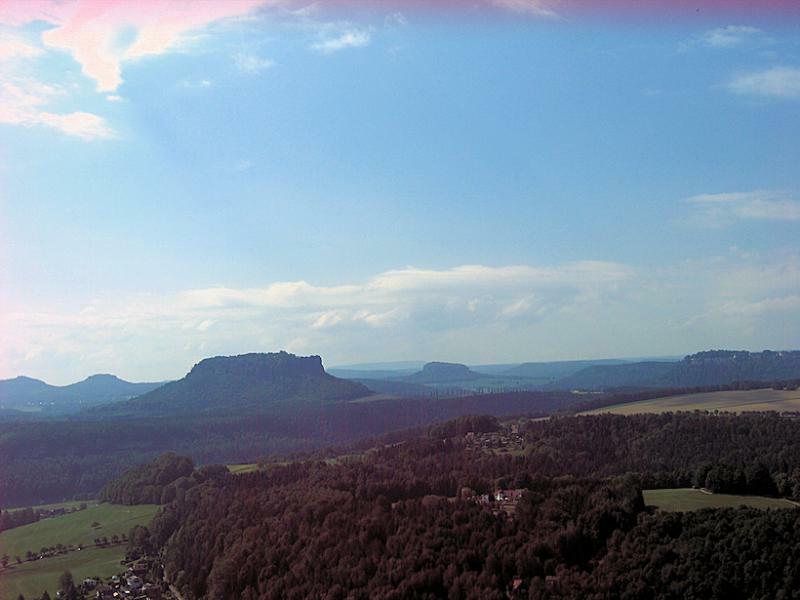 The Sächsische Weinwanderweg was devised in the late 1990s but not officially opened until 2006. 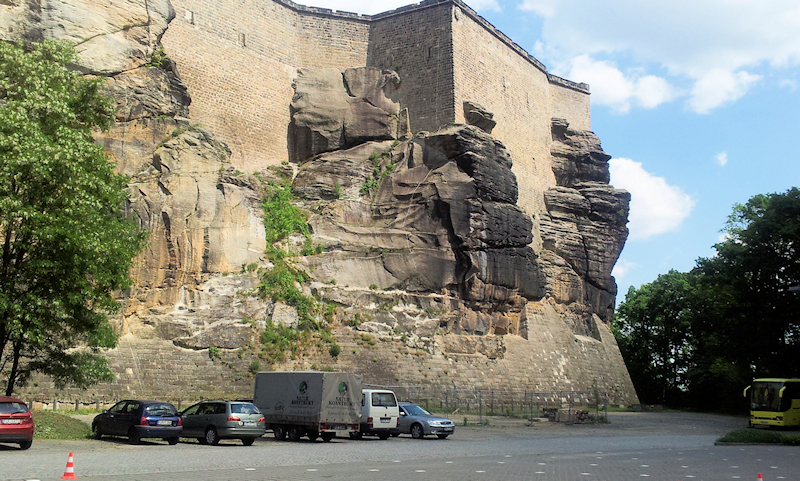 Like all such routes it was intended to encourage tourism and publicise the region's wines. 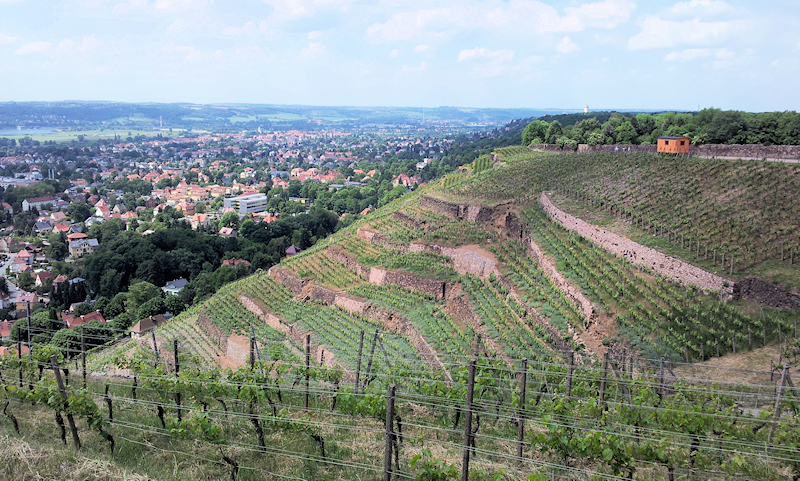 The trouble is that although wine has been produced in the area for at least 450 years many of the vineyards have been lost to expansion of the towns and villages along the river Elbe. Instead of taking walkers through vineyards the route mostly takes them through suburbs. On tarmac roads. "Here on the left", says the guidebook, "is a fine house that once belonged to a renowned winemaker". Further along, "The houses on the right are on the site of a vineyard which ceased production in 1934". So we found ourselves following roads and from time to time turning uphill, walking along a higher parallel road or track and then returning downhill to the road we had left half a mile earlier. We had walked round a vineyard which no longer existed. 'Up-along-down' became a familiar pattern. Apart, that is, from the time when the guidebook confused 'up' with 'down' and 'right' with 'left' and we walked uphill through more suburbs for a hot mile and a half only to decide we had to turn round and go back down without the normal 'along' bit. Mutinous voices in the ranks grumbled about the Grand Old Duke of York but Clive pretended not to hear. Our way to Dresden took us through Pillnitz and a fine stately home built for one of his fourteen mistresses by Augustus the Strong (don't ask! ), Elector of Saxony. It's built in a Chinese-influenced version of German baroque. 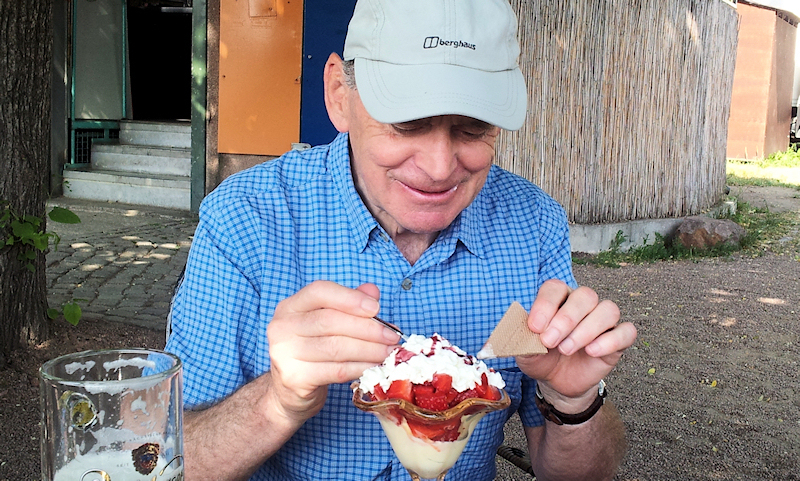 From there a tediously long and hot slog to Dresden itself mostly along a main road and then a busy cycle track finally got us to our hotel. 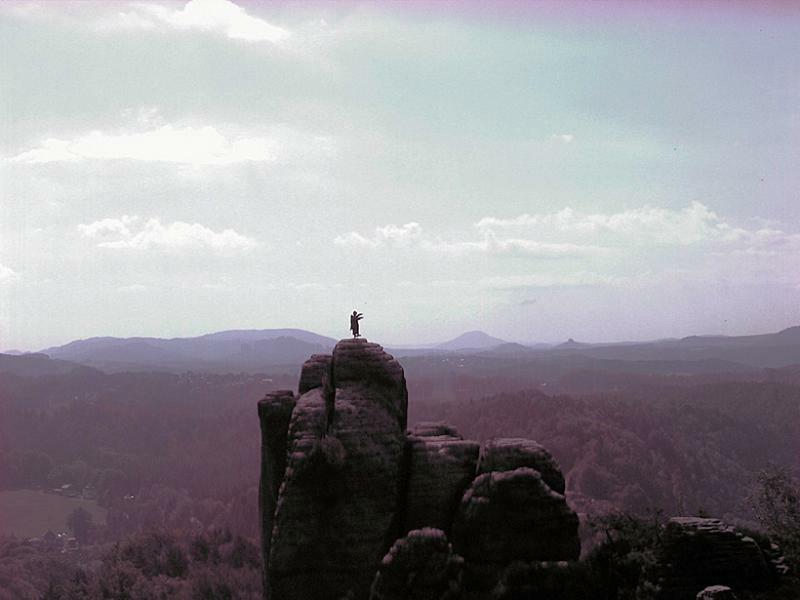 The three days from Dresden to Meissen were each fairly short. The ratio of open country and woods to suburbs and tarmac was higher and we had got used to the kind of walking to expect. The Goldener Anker Hotel at Radebeul, our first stop after Dresden, was the best hotel of our trip. I rated it 'excellent', with the others ranging from 'perfectly acceptable' to 'very good'. 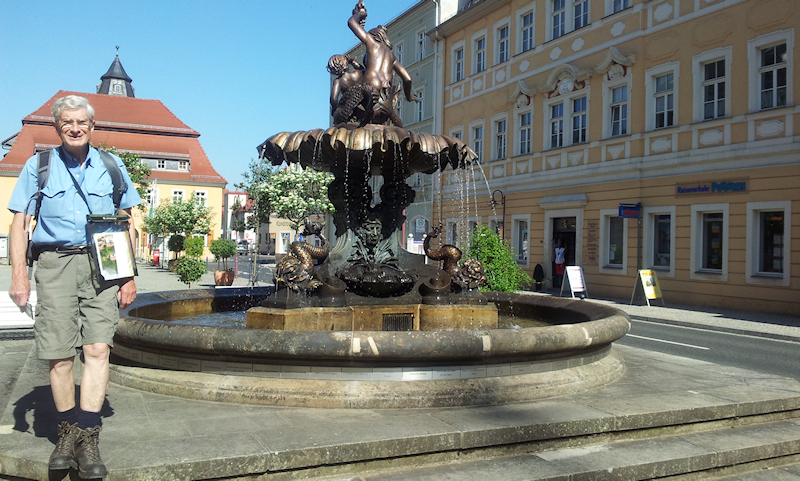 We spent our last day in Meissen and left early the next morning to travel by taxi, two trains, a bus and plane back to England. Despite the disappointment of the Wine Route it was a good trip. The company, food and accommodation were all good. The scenery for the first part of the walk was interesting and different and although the second part was a bit dull I still enjoyed walking in perfect weather. We had no rain during the whole trip and daytime temperatures were generally in the low to mid twenties. 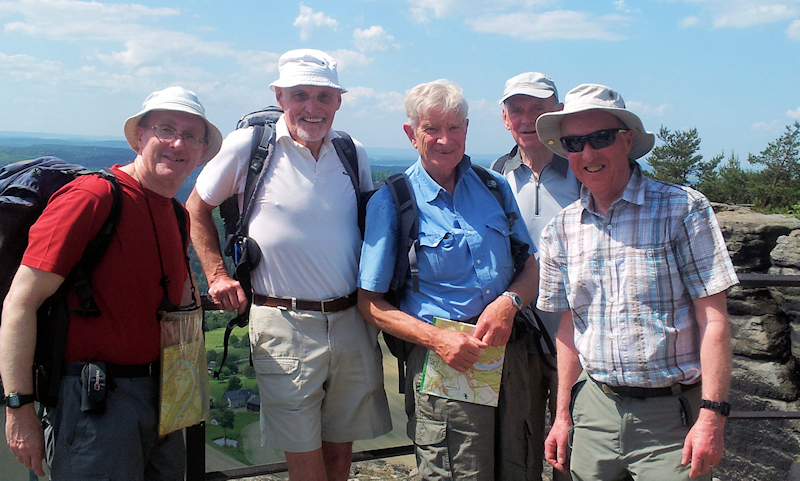 My thanks to Clive for organising, and to all four fellow walkers for their entertaining company.